Dhaka City College Admission. See Dhaka City College Admission Result and online Application 2018. 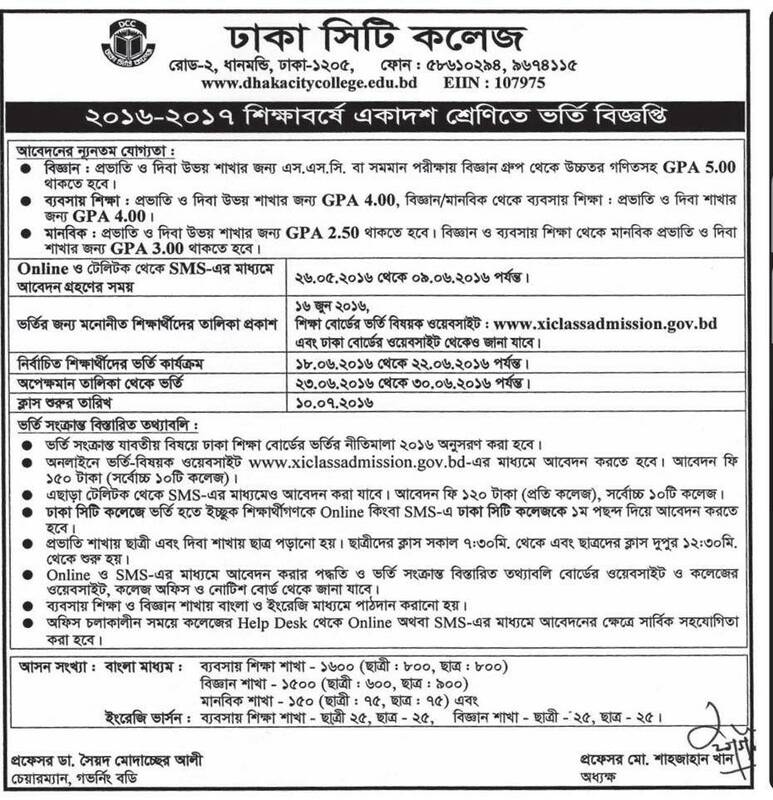 Dhaka City college has been publish admission notice for the SSC passed students. You can see their criteria and activity in our website. Dhaka City college in one of the famous college in our country. Every year huge amount of students has been pass HSC exam with good credit. You can apply or see Dhaka City College Admission Result and online Application 2016 notice from our website. Recently a admission notice has been publish by the authority of Dhaka City College. The circular has been publish in their official website and daily newspaper. They are invited to application for admission in HSC course. Dhaka city college has been leading their activity in two sift. The morning sift for the female students. Day sift is for male students. Here we included all information for admit in Dhaka City College. Science Group: You have to must GPA 5.00 in SSC or equivalent exam for morning and day sift both. Business Study: You have to minimum GPA 4.00 in SSC or equivalent exam for morning and day sift. Humanities Group: Minimum GPA is 2.50 in SSC or equivalent exam for both morning and day sift. Application Process: You have to apply by teletalk mobile. Application system is same among other college. Here we give you application process for Dhaka city college. If you have a teletalk SIM. Then go to write massage option and simply type. CAD<space> 107975<space>First two letter Desired Group<space>1st 3 letter of your SSC board<space>SSC Roll No.<space>Passing Year<space>Shift Name<space>Version send to 16222. After sending this SMS you will relieved a reply SMS via teletalk. They are provide a Application ID and password then you have to visit Bangladesh Secondary college admission official website. You can going this website from our site. You can complete this application below link. Click below link and complete your Application formalities. All admission matters are follow by Dhaka Education Board Admission policy 2016. You can apply by SMS. Application Fee is 120 Taka for every college. Female students are study in morning sift and male students are study in Day sift. Morning sift is start 7:30 AM and Day sift is start at 12:30 PM. Business study and Science Group students can study Bangla or English both Medium. If you need more information read the circular that is given below.